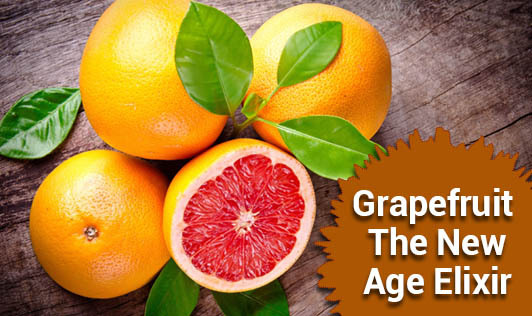 Grapefruit is a good source of Vitamin C, Carotenoids, Potassium, Fiber, Pectin, Copper, Biotin and other nutrients. It is a rich source of the antioxidant, lycopene. Lycopene has been shown to prevent cancer. It is heart friendly. A study published in the Journal of Agricultural and Food Chemistry states that consuming one grapefruit a day can help lower "bad" LDL cholesterol levels by 15.5% and triglycerides by 27%. It provides a natural skin lightening effect. Get rid of your dark knees and elbows by cutting a grapefruit in half and sprinkling some sugar over it. The presence of vitamin C helps the dark pigmentation to lighten up. Don’t use it on the face though as it may have adverse effects on sensitive skin. A study published in the Nutrition and Metabolic Research Center at Scripps Clinic in La Jolla, California states that grapefruit kick starts your metabolism and helps you lose weight. They recommend consuming half grapefruit before each meal. It helps in keeping the skin firm as it is a rich source of collagen and vitamin C.
One word of caution though, grapefruit increases the potency of some prescription drugs, so do consult a doctor before you dig in to this wonderful tasty fruit.